One look at the Horizon 10.1 and you sense the situational awareness provided by its large screen and wide field of view that reaches out 30 miles. 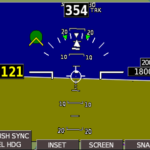 You can select either a “six pack” representation of the primary flight instruments, with adjustable shading behind the gauges, or the standard PFD. 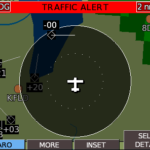 On the standard PFD you’ll find pilot-selectable insets and split-screen views providing maps, traffic, engine monitoring, weather, traffic alerts, custom checklists, and even geo-referenced sectionals or en-route charts, keeping the PFD view unchanged so that your instrument scan remains unchanged. Auto-pilot ready, ADS-B and remote avionic control capable. 10.1″, High resolution (1280×800) IPS display. 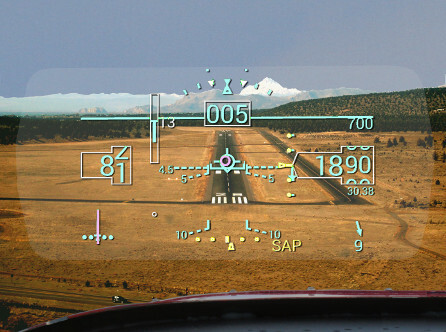 IFR approach option available! Insets are also complimented by a split-screen view. 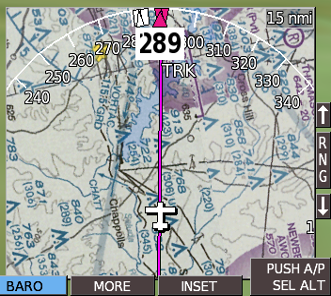 This a popular feature with single screen installations, providing generous size primary flight data, moving map and engine data, intelligently combined on one screen; practically eliminating the need to change your screen selection. 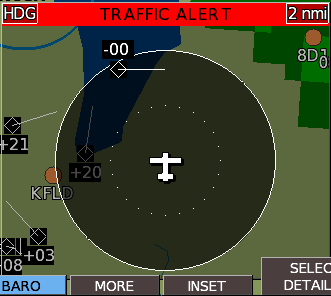 Both the full- screen PFD and Map views can display inset windows in the lower corners of the screen. Click one of the thumbnails below to explore the details of the various insets. The Horizon 10.1 expands your options by letting you remotely control as much or as little of your radio rack as you desire. The dedicated controls and simple operation makes this immensely practical, leaving your valuable panel space available for other uses. Remote up to 2 Com radios, 2 Nav radios, transponder, intercom, and audio panel. Panel mount radios can also be conveniently tuned. The Horizon 10.1 works with a variety of leading avionics manufacturers, so you will never be locked into one brand for your interfacing remote avionics. Remotes, such as the Trig TT22 transponder, can offer a cost savings by negating the need for a dedicated control head. As with the HXr, the Horizon 10.1 allows you to use your Android device for extensive touch-screen menu tuning choices for you or your co-pilot. 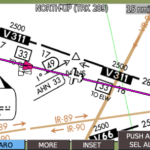 Sectionals, airport diagrams, en-route charts and approach plates can be displayed, with the airplane position geo-referenced on them. 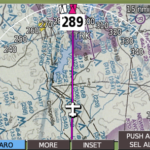 Sectionals and en-route charts are displayed with Horizon 10.1 generated airspace, obstacles, flight plans and traffic overlaid, so that alerting is not lost. Data for these functions is provided by Seattle Avionics. 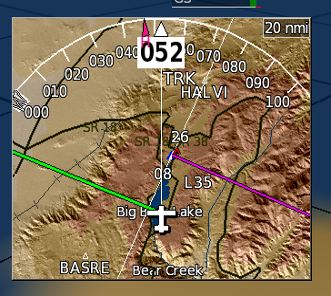 The Horizon 10.1 also includes a PDF viewer which allows you to display free approach plates, airport diagrams and other data provided by the FAA. (Geo-referencing is not provided). Having produced the EIS engine monitor for over 20 years, we’ve accumulated a great deal of personal and customer engine monitoring experience. From this came such exclusive features as the exhaust gas temperature (EGT) time history. With a simple graph of the last two minutes of all EGTs, our engine monitoring system makes it effortless to distinguish between engine problems affecting one cylinder, or the entire engine. This distinction could be essential when making decisions in response to engine problems, especially at critical times such as initial climb out. We find it so useful that we never takeoff without it displayed, and we recommend you don’t either. 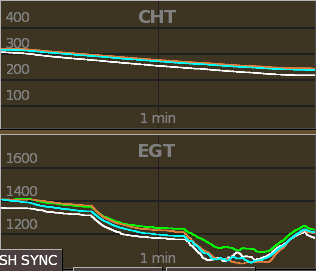 As a practical matter, the EGT Time history is our favorite way to get reassurance of normal engine operation. Now whenever you fly over water, or at night, you will have the confidence that only comes from seeing a history of steady EGTs. It reduces anxiety and adds confidence to any flight. CHT time history proves useful by making the trend obvious. This is especially useful in high-performance airplanes, such as RV’s, Lancairs and all pushers, where engine cooling can require some pilot technique to manage. It leaves no doubt which way temperatures are headed. When it comes to flying economically, the specific fuel consumption (SFC) display is just the ticket. Its measure of engine efficiency confirms when you have leaned properly and tells you when you need to lean again. Without SFC, it is nearly impossible to know if re-leaning is required due to changing conditions. 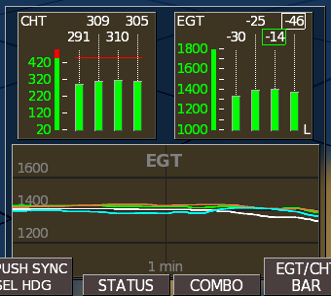 Next to the EGT time history, this is one of our favorite engine monitoring features. It literally pays for itself. Miles per gallon through the air makes it easy to detect changes in efficiency of your airplane due modifications for drag reduction or if you just forgot to fully retract your flaps. Miles per gallon over the ground lets you optimize your economy while accounting for the wind. Engine data is provided to the Horizon 10.1 via the Engine Information System (EIS). The EIS is a complete instrument with a display and user-interface. Models are available for practically every engine, from 2-strokes, 4-strokes, turboprops and turbines-we have instrumented it. 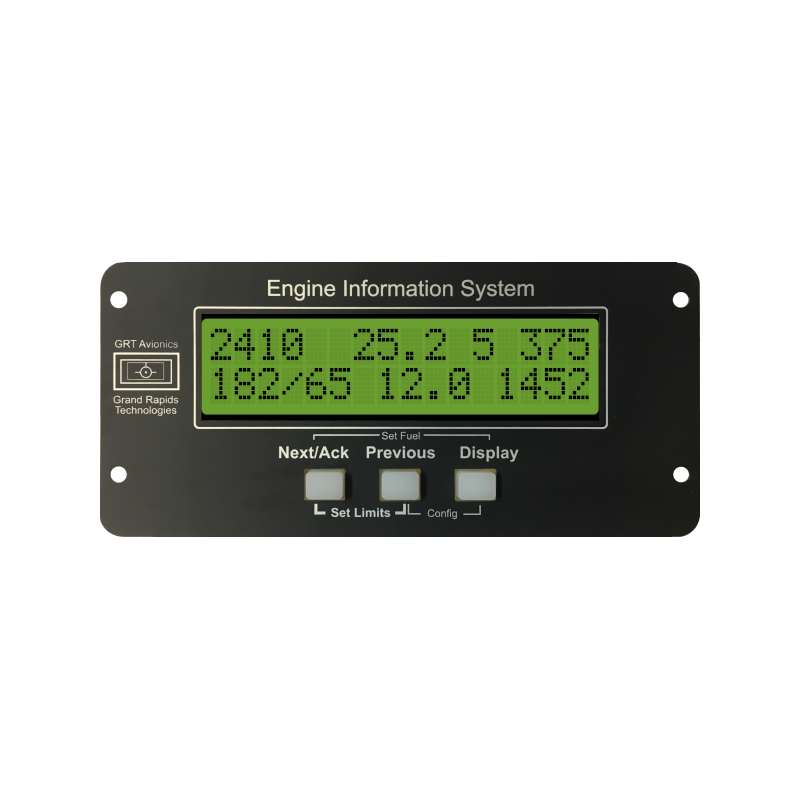 The EIS may be remotely mounted, just like any data collection device, but it can also be mounted in the instrument panel as a primary or backup display of engine data. In tandem seating airplanes it can be used as an instrument for the rear seat. Engine limits can be set in the EIS and can be used to drive its own warning light, even when remotely mounted. Simplified screen layouts and more buttons also allow for simplified operation. Menus are practically identical for the PFD and map screens. New to the EFIS and not sure what a softkey does? 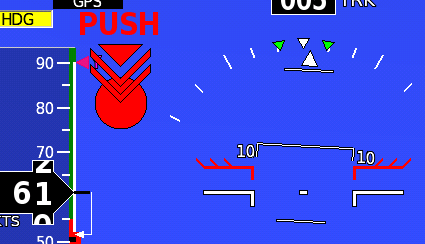 Go ahead-press it! Every softkey is labeled and the Horizon 10.1 shows you the options available before it does anything. Pressing the same softkey again exits without action. Always find your way back to the main screen view with the blue “HOME” softkey. Color coding and “hold for shortcut” features further streamline operation. Simple, effective and efficient. 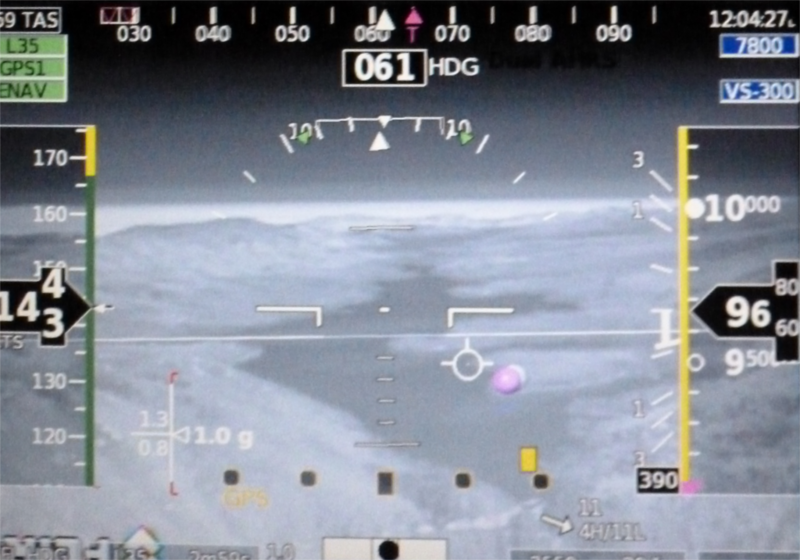 When on the ground or in calm air, practically any pilot interface will work. Introduce turbulence and the story changes. To operate an EFIS in such conditions, the pilot must be able to position his fingers on the control (knob or button) without activating it. Activation of the control can then take place with assurance the intended operation will be performed. This is why the Horizon 10.1 does not have a joystick type control. It has high-tactile force knobs and buttons and a ledge above the buttons to steady your hand. It’s proven, and it works. Redundancy will not be compromised in panel designed around the Horizon 10.1. The extensive interfacing and processing power of the Horizon 10.1 allows dual inputs for attitude/air data, while still accommodating dual GPS and nav/com into every Horizon 10.1 display unit. Automatic cross-checking is provided, and rarely must data sources be divided among display units. Each device is wired directly to each display unit, creating a simple, robust connection for ultimate redundancy. Data buses are not used for communication between various devices, as these introduce the opportunity for a single point failure. Even dual data buses are subject to possible data overloading or other common mode faults that can simultaneously fail both buses (as has been experienced by one of our competitors). The Horizon 10.1 includes full autopilot functionality. Just add GRT servos and you are on your way to a fully automated cockpit. Like all GRT EFIS systems, it can also control an external stand-alone autopilot. Even without servos, all autopilot functions are available to drive the flight director, giving you a single cue to follow to control attitude and navigation, greatly improving accuracy while reducing workload. Read more here. Already own an autopilot? Just wire it to the Horizon 10.1 and it will couple it to all your navigation sources. The Horizon 10.1 supports forward looking low-light or infrared cameras. 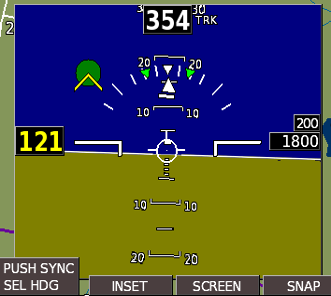 Controls are provided to scale and align the video with the EFIS orientation. 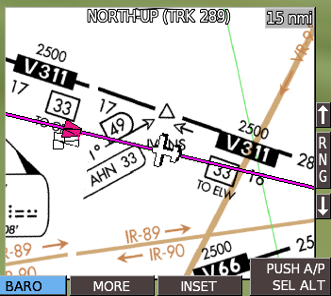 This allows the EFIS to draw outlines around runways and way-points, and also show the flight path marker correctly against the image from the camera. Video can also be displayed without an overlay, as might be desired for other camera views. Voice alerts are provided for critical engine and flight conditions, as well as altitude call outs. System changes, such as autopilot disconnect and way-point passage are also annunciated. Angle-of-attack audio utilizes an attention-getting beeping tone that increases in urgency as your approach stall. You can even use your own audio recordings for your alerts. The GRT Avionics AOA function drives on-screen AOA symbology that shows too fast/too slow/optimal approach speeds, as well as stall warning. 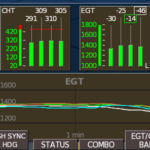 In addition, an audio output is providing an approaching stall warning annunciation (a pulsating tone that varies with proximity to the stall warning angle) and a solid tone indicating stall is imminent. Sensing is via a two-port 45 degree pitot tube, such as those commonly available from a variety of manufacturers, or using a probe fashioned by the builder. This method has no moving parts, and allows the use of heated pitot tubes that preserve the stall warning function even in the presence of icing. Install an optional Bluetooth dongle and connect with your Android phone or tablet using our GRT REMOTE App for Android. 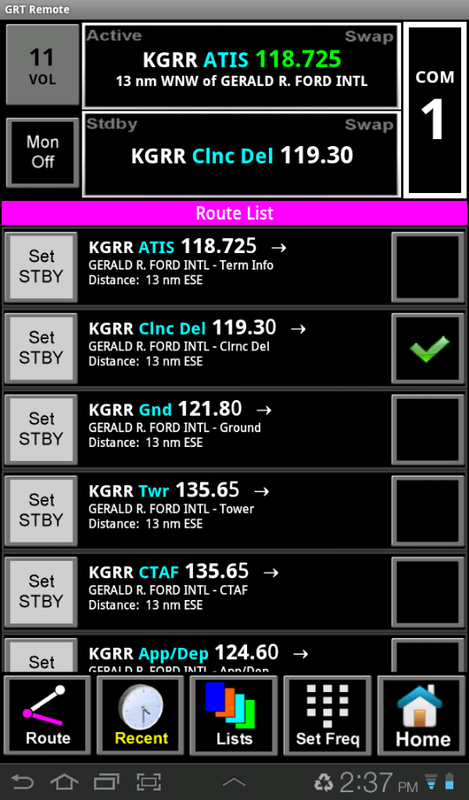 Fully control your connected radios, create & edit active flight plans and view the flight instruments all on your Android tablet or phone–perfect for the backseat co-pilot! The radio tuning portion of the app offers so much information, you may not want to tune them without it! The integrity of an EFIS is dependent on the integrity of the attitude data that drives it. GRT Avionics has always lead the way with the only AHRS in the industry that can operate without airspeed or GPS aiding it. Read more about the latest generation of AHRS here. Navigation database updates are provided free for all US territories. Software updates are also free. All GRT equipment includes bootloaders, allowing them to be updated via USB without removing them from the airplane. The Horizon 10.1 includes 12 serial ports, in and out, and dual USB ports. Multiple display units are coupled via Ethernet. Analog interfaces include 6 analog inputs and 6 discrete outputs. We have the interfaces you need now and in the future.